The Racing Consultant, greyhound handicapping at a pro level! Night of Stars is the SUPERBOWL of Greyhound Racing! Hello my name is Marcel... I'm known to most in greyhound racing as The Racing Consultant. I enjoy an impeccable reputation across the country and around the world. I have been playing greyhounds on a pro level for almost 30 years and I am the only "ONE on ONE" teacher of serious greyhound players in the world. This has been and continues to be my sole occupation for over 30 years. In 1995 Racing Greyhounds Magazine wrote 2 front page feature articles depicting me as the top pro greyhound player in the country. Tommy Thomas a writer for Racing Greyhounds Magazine decided to put WOFS to the test tracking my every day/night play for 90 days! Short version... WOFS turned a profit of $158,000 IN 90 DAYS! 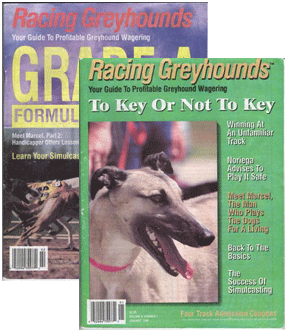 Tommy then wrote about it in the 1995 January & February issues of Racing Greyhounds Magazine. I got into greyhound racing almost 30 years ago looking for a handicapping method that would not only work now and then but all the time. After watching thousands of races, I noticed that most of the races (75%+) were won by the 1st or 2nd dogs to reach the 1/8 call. WOFS (Who's Out First & Second) is a well kept secret & loop hole in greyhound racing. This loop hole is useless without knowing The WOFS Speed Method. After 3 years of testing, I finally found the solution to locating who the 2 WOFSDOGS are before the race starts 95% of the time. The next step was to qualify a winner to use on top in my wagering which I refer to as my STARDOG! However, finding a winner is one thing but making a profit is another. I realized betting for profit was as important if not more important than finding a STARDOG. So, I created a coding process to identify other key dogs in the race so that each race can be structured to take full advantage of WOFS as well as my Stardogs to hit multiple trifecta & superfectas. I then use my patented Bet Generator to structure the bet in less than a second! My split mini & micro betting techniques help you realize a profit no matter what the outcome. After 3 years of research analysis and testing, I was very profitable on paper, so that's when I decided it was time to play for real. That was almost 30 years ago and I have been playing greyhounds professionally ever since. Playing greyhounds as "my sole occupation" for over 20 years. What kind of player am I? I'm a businessman. I do not consider myself just a gambler. Surprised? Well you shouldn't be. This should be obvious by now. I always do everything to make sure that when I do make a bet. I use every advantage and never bet until I find a race that meets my Stardog criteria. Then and only then do I make a short term investment on trifecta & superfectas only. Obviously, Twin-Tri & Tri-Super jackpots are also included as part of my everyday play. My investments are much shorter than most. They are only 30 seconds long most of the time and the profit margin is huge! I do not play or gamble on any other sport but greyhound racing. I play greyhounds on a pro level and teach serious players to do the same. I play out of Daytona Beach in Florida. I've played at every dog track in the country but my home track is Daytona Beach Kennel Club. I am very well known at DBKC as well as around the country. DBKC has been my base of operations for almost 30 years. My table in the Club House dinning room is reserved all year round and has 2 TV's with a remote control and a mini bar. They treat me very well that's for sure! My reputation is beyond reproach! I take great pride in all of my accomplishments in greyhound racing. 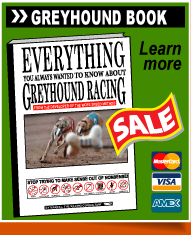 I have had feature articles written about me after proving to a writer from Racing Greyhounds Magazine that my WOFS Speed Method made a profit of $158,000 in 90 days! RGM being tracked for 3 months. I also have a list of testimonials a mile long and the documentation to back it up as well. My website is like no other in this business and anyone who knows about greyhound racing need only spend but a few minutes on my website to realize this for themselves. I am the only handicapper in the world that can and does post his own winning tickets on the Internet. Why don't the other handicappers post their winning tickets? Wouldn't you post tickets like I do if you did as well? My guess is they simply don't have anything of substance to show you or believe me, they would if they could, but they can't so they don't. It's as simple as that. Let's face it... You get what you pay for in life don't you? And, so far you have gotten what you paid for which is why you're looking for a "better way" to handicap for profit and why you're here today. Make the most of it and go to our training programs section and see which professional training program is best for you. The Racing Consultant is an avid car collector [click here] to see his collection.